"There is a yet unnamed art movement that may prove to be of some significance, and Burning Man is close to its center. It often manifests itself as circus, ritual, and spectacle. It is a movement away from a dialogue between an individual artist and a sophisticated audience, and towards collaboration amongst a big, wild, free and diverse community. It is a movement away from galleries, schools and other institutions and towards an art produced in and for casual groups of participants, more akin to clans and tribes, based on aesthetic affinities and bonds of friendship. It is a movement away from static gallery art and formal theater and towards site-specific, time-specific installation and performance. It is a rejection of spoon-fed corporate culture and an affirmation of the homemade, the idiosyncratic, the personal. It is profoundly democratic. It is radically inclusive, it is a difficult challenge, and it is beckoning." What are people doing here? I did a solo performance doing both visuals and music with the Space Palette Pro at the Outsound New Music Summit in San Francisco. Here's a nice review. Another June, another SubZERO Festival in San Jose. The Photon Salon showed both the old and new Space Palettes. Cathy Thompson, my best friend and partner in life for over 40 years, passed away on April 21 after a 16-month battle with pancreatic cancer. An album of memorial photos can be found here. 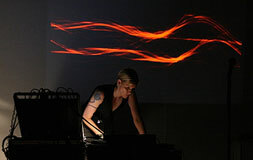 I started having some Photon Salon meetups at our house to provide opportunities for visual instrument experimentation. The Building Bridges Art Exchange brought their Synaesthesia show to the huge LA Art Show, and included the Space Palette. 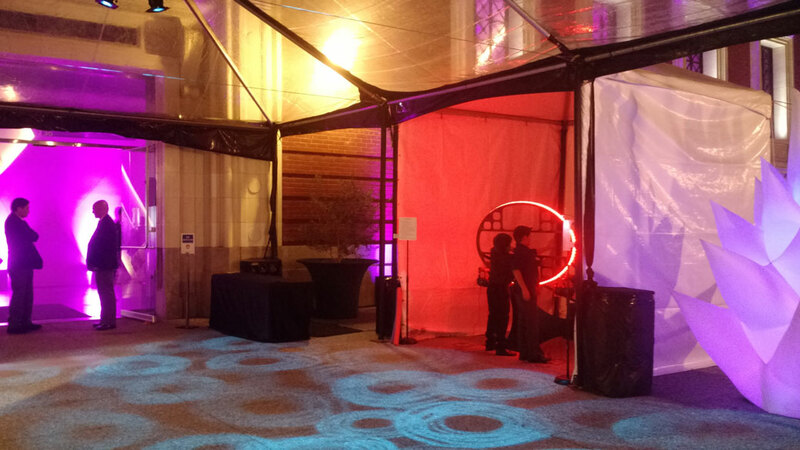 I brought the Space Palette Pro to another Exploratorium's "After Dark: GLOW" event, where it was displayed in a very nice setting with a large screen and seating for an audience. Three in one place! Two of the original Space Palettes and one of the new Space Palette Pro were displayed for almost a month at the Artechouse in Washington DC. While it was a royal pain to ship them, it was a wonderful opportunity and experience. 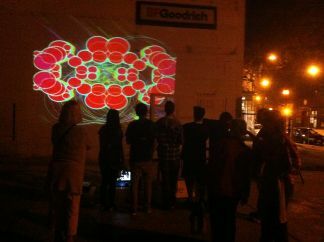 Bill Wiatroski and I joined forces to do visuals at the Robotspeak anniversary show in San Francisco. I had a new HDMI video mixer which allowed us to mix our visuals together. I used the Space Palette Pro to do visuals ony - the music was provided by modular synth performers. While in Washington DC to see the Lumia show, Louie and I checked out a new technology-focused art space called the Artechouse, where they were showing interactive visual art. I showed them videos of the Space Palettes, and the next thing you know I'm planning on shipping three Space Palettes to Washington DC to show there. And then there were two. I built a second Space Palette Pro using Appleply wood for a better finish. It's a bit thinner, too. I went to Washington DC with Louis Brill to see the amazing "Lumia: Thomas Wilfred and the Art of Light" show at the Smithsonian. It was incredible - so good that I visited it three times. I brought the Space Palette Pro to the Synaesthesia Dance Experience at the Actors' Gang in Culver City. I brought the Space Palette Pro to the Venice AfterBurn event in Venice Beach. I installed a Space Palette at the Building Bridges Art Exchange in Santa Monica, as part of their "Synaesthesia: What is the taste of the color blue?" show. Two Palettes in one place! I brought both the original Space Palette and the new Space Palette Pro to the Institute For The Future in Palo Alto. I brought the Space Palette Pro to the lobby of the Wiltern Theatre in LA for the "Easy Rider Live" show. I brought the Space Palette Pro to the Touch the Gear event of the Outsound New Music Summit. I brought the Space Palette Pro to Sensel in Mountain View, to show them what I've done with their amazing Morph. Cathy and I took a short vacation to San Diego, checking out the zoo and taking a Segway tour of Balboa Park. For SubZERO 2017 in San Jose, the Photon Salon included both the brand new Space Palette Pro as well as the LinnStrument-based UniLooper. The first prototype of the Space Palette Pro is operational. I brought the Space Palette to a fundraiser event at the Exploratorium. I helped Joel Davel by doing video at a Grey Area memorial event for Don Buchla. I participated in the LAST Festival at the SJSU Hammer Theatre Center in San Jose. I brought the Space Palette to the Worlds Fair Nano in San Francisco. The Space Palette's month at the exploratorium ended with another "After Dark" event. I installed a Space Palette for people to play with at the Local Color artist collective in San Jose. It was there for 6 months. I brought the Space Palette to the Exploratorium's "After Dark: GLOW" event. The Exploratorium folks liked it so much that they asked to keep it there for the rest of the month. November, 2016 At the LoveTech Resurgence event, I brought UniLooper for people to play with in the Jam Lounge, and performed a couple sets with LoopyCam. October, 2016 I performed with LoopyCam at Binary Society's season-ending concert in San Jose. October, 2016 Cathy and I took a trip to the east coast and enjoyed all the fall color. October, 2016 I performed with LoopyCam at Moldover's album release show. August, 2016 Burning Man - my 15th year in a row. 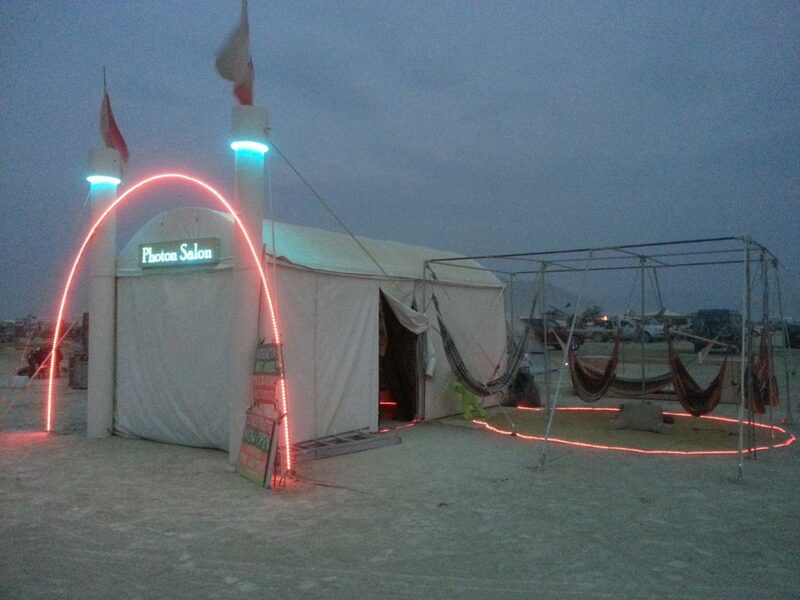 As in 2014, we camped in Illumination Village and set up the Photon Salon on the Esplanade. In addition to the Space Palette and Deeje Cooley's tappr.tv dome, I brought my UniLooper installation. Here's an album of photos and videos. Issue 8.3 of Content Magazine included an article about me and the Space Palette. I brought the Space Palette to their "pick-up party" for the issue. The picture that Daniel Garcia took of me now graces the splash page of timthompson.com. August, 2016 I gave a talk/demo about UniLooper to the SF Electronic Music Meetup group. These are the slides I used. August, 2016 I brought LoopyCam to participate in the Tech Museum's Creative Collisions: Light & Dance event. Here's a short video from it. July, 2016 I brought the Space Palette to the Northern Nights festival. Because it was placed in a shaded grove of trees, the Space Palette was able to run 24/7. Here's an album of photos and videos from it. June, 2016 Cathy and I went on a roadtrip to Phoenix, Tucson, and Santa Fe. In Santa Fe, I was able to visit the amazing Meow Wolf's House of Eternal Return. June, 2016 I brought the Space Palette to the Big Surreal in Carmel Valley. I brought the Space Palette again to the SubZero Festival in San Jose. Here's an album of photos and videos from it. I brought the Space Palette again to UnScruz, the regional burner event in Santa Cruz. This year it was placed inside one of the buildings, so it could run 24/7. December, 2015 I demonstrated the UniLooper and gave a talk about my artwork for a school assembly at the Head-Royce School in Oakland. 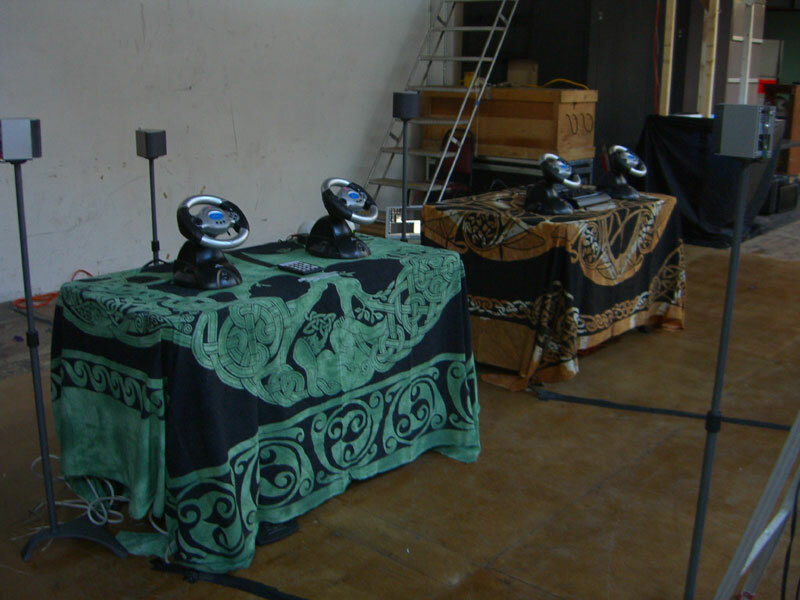 November, 2015 Two Bit Circus brought their wonderful STEAM Carnival to San Francisco this year, and I again brought the Space Palette for kids and their parents to enjoy. October, 2015 I demonstrated LoopyCam at a meeting of the Silicon Valley Ballet Tech Committee. October, 2015 I brought the UniLooper and LoopyCam to Figment Oakland, where WorldStage set up a nice daylight-visible screen that was used by a variety of visual artists. October, 2015 I did my first UniLooper performance as part of the Y2K15 International Live Looping Festival. October, 2015 I brought the Space Palette to TEDxHarkerSchool in San Jose. October, 2015 I brought the UniLooper to the Digital Night of the GLOW Festival in Santa Cruz. September, 2015 I brought the Space Palette to Chillits, where it was installed inside a huge teepee - a great setting. I also did several hours of LoopyCam to accompany the chill-y music. September, 2015 For my 14th year in a row at Burning Man, I decided to take a vacation from doing installations, and went as a (gasp) spectator. I used my newly-acquired 1990 Chevy G20 van and only went for half the week - got there Wednesday and left Saturday. Because I didn't have a project, I had time to check out the artwork more. It was a good year for art. August, 2015 I was honored to have the Space Palette included in the month-long exhibit Technological Mediations at the Art Works Downtown gallery in San Rafael, CA. July, 2015 I brought the UniLooper installation to Touch the Gear Expo as part of the Outsound New Music Summit. June, 2015 I brought the Space Palette to the Illuminated Forest at What The Festival, 90 miles east of Portland, Oregon. June, 2015 I brought the Space Palette to the excellent CURRENTS New Media Festival in Santa Fe, NM. June, 2015 I brought the UniLooper and LoopyCam to the SubZERO Festival in San Jose. June, 2015 I gave a phone interview for Darwin Grosse's Art+Music+Technology podcast series. May, 2015 I particpated in VizCamp 2015, bringing and playing the UniLooper instrument, doing both visuals and music. 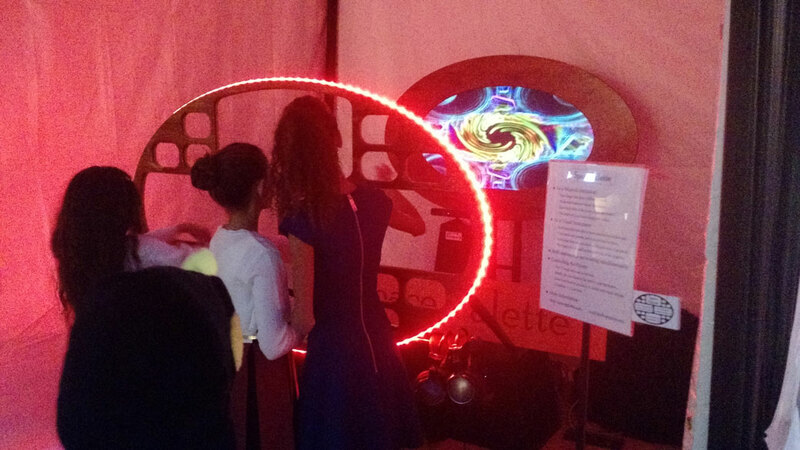 May, 2015 I brought the Space Palette to the Lightning In A Bottle festival, as part of the Giggle Juice Courtyard. May, 2015 I brought several installations to Maker Faire 2015 - my booth was called Casual Instruments for Music and Visuals. 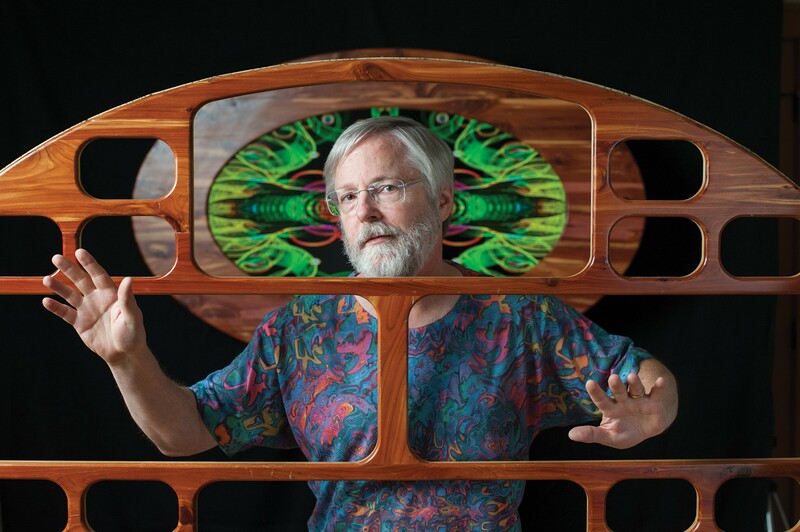 It was the first Maker Faire appearance of the furniture-quality Space Palette, and the first public appearance of the UniLooper instrument that uses the new LinnStrument controller. May, 2015 I helped organized and then participated in the first SCATfest (Santa Cruz Arts & Technology Festival in Santa Cruz. I gave a short talk on my work, and then did LoopyCam for a dance performance by Mercedes Johnson wearing the LED clothing of Catarina Hosler. May, 2015 I brought the Space Palette and LoopyCam to the weekend campout/gathering of UnScruz, the Santa Cruz regional Burning Man event. April, 2015 For the third year in a row, I brought the Space Palette to Lucidity Festival. It's one of my favorite festivals, because of the intimate atmosphere and woodsy setting. There's now a Space Palette semi-permanently installed at the KALEID Gallery in San Jose. It's operational and available for anyone to play whenever the gallery is open. The Space Palette was installed for a couple of months at the BHuman Social Innovation Center in Palo Alto. I gave a talk on my artistic work at their opening. I attended the Laptop Music Meetup in Mountain View and showed an early prototype of what would become the UniLooper. I brought the Space Palette to the Burning Man Artumnal Gathering. I brought the Space Palette to the Children's Museum of Discovery in San Jose for their Play Your Way evening for autistic children and their parents. I brought the Space Palette down to Long Beach, CA, for 3 days at the wonderful STEAM Carnival 2014. 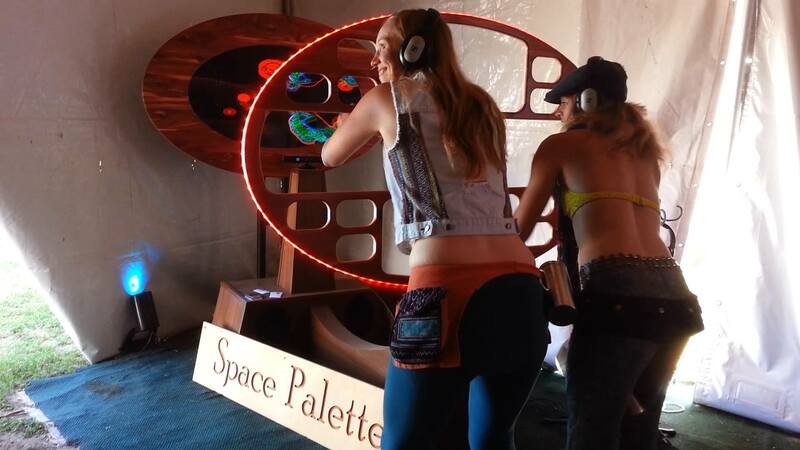 I brought the Space Palette to the GLOW Festival in Santa Cruz, CA. I brought the Space Palette to the IndieCade 2015: Night Games event in Culver City, CA. I brought the Space Palette to the fabulous Anne and Mark's Art Party at the Santa Clara county fairgrounds. For Burning Man 2014 our sub-camp (Space Palace) within Illumination Village created another Photon Salon - this time it included a dome with Deeje Cooley's tappr.tv, and the first Burning Man appearance of the new furniture-quality Space Palette. The Space Palette ended its six-month appearance in the REBOOT:music exhibit at the San Jose Tech Museum. I helped Olenka Villarreal find installation artists for the Magical Bridge Playground in Palo Alto. I participated in Nicole Zvarik's Resident Artist's Workshop - Resilience, bringing LoopyCam. I participated in the Venice Beach Art Crawl, bringing the Space Palette. I participated in SubZERO 2014, bringing the Space Palette. I brought the Space Palette to the San Jose Museum of Art Community Day, doing a short talk and performance. "Make your own Space Palette" is the name of a workshop I ran at the San Jose Tech Museum, as part of the Reboot:music exhibition. I polished up a new release of the MultiMultiTouchTouch software, and taught people how to use it. I performed with LoopyCam at the REBOOT:music Live!" event at the San Jose Tech Museum. I did two sets, accompanying Daniel Berkman and Onyx Ashanti. Lucidity is one of my favorite festivals, near Santa Barbara in a nicely wooded campground. 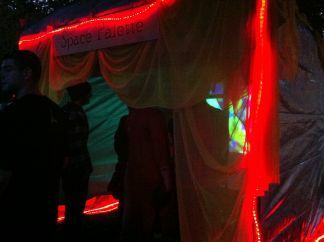 Paul Sable-Snibbe and I went and installed the latest version of the Space Palette in the Lucidity University tent. The latest version of the Space Palette is a furniture-quality instrument, thanks to a collaboration with Paul Sable-Snibbe. It uses a monitor in a matching wood frame, rather than a projector. It is now installed in the San Jose Tech Museum, as part of the Reboot:music exhibition. Here's a video that shows me explaining it. Cathy and I took a trip to Australia (our first) and had a great time in Sydney and Melbourne. I brought the portable version of the Space Palette and gave a talk to the OpenLAB group in Melbourne, here's a video of the entire talk. I participated in the CODAME Art+Tech Festival, bringing both the large and small Space Palettes. The large palette I used was a nice laminated wood one with lots of different woods, made by Paul Sable-Snibbe. Another year, another Burning Man - my 12th in a row. I again camped in Illumination Village, and built the Photon Salon, an enclosed tent where light-based art could be displayed - it showcased the Space Palette (actually, 4 of the new smaller Space Palettes, with completely new sounds and graphics), tappr.tv (an iPad-based instrument by Deeje Cooley), and LoopyCam. June, 2013 I displayed the Space Palette in the art gallery of the TV of Tomorrow conference. June, 2013 I gave a talk at CCRMA on my exploration of 3D input. Here are the slides. I took the oval Space Palette to Maker Faire for the first time. 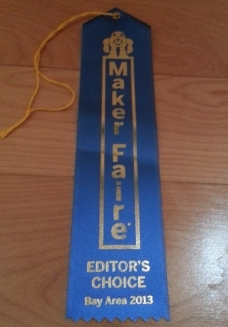 A Make magazine editor wrote a blog post about it and gave it an Editor's Choice blue ribbon. 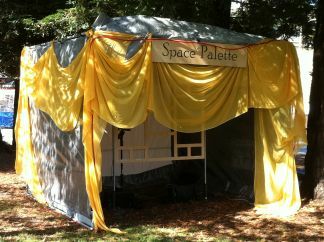 I set up the Space Palette in a sun-blocking tent at Lucidity 2013 so it could be used during the daytime. 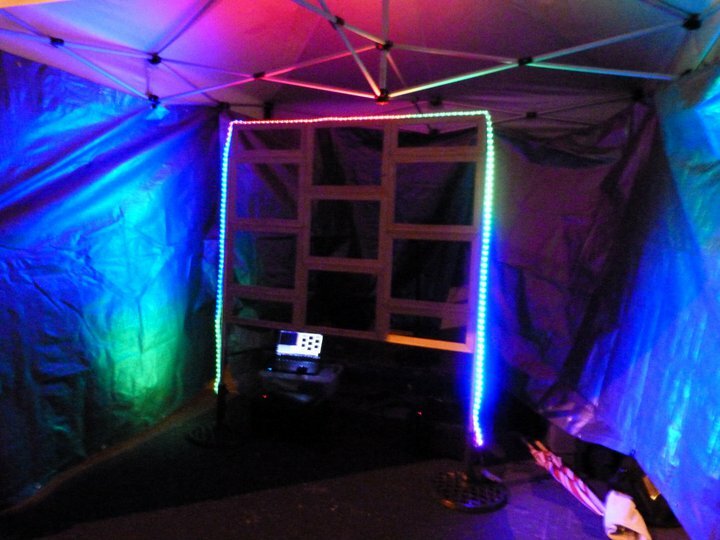 The outside wall of the tent was white, so I used it as a projection screen for using LoopyCam at night. This video shows clips of both. I participated in the SOURCE Interactive Arts Festival on Maui, setting up the Space Palette in the MUSEarium - a gymnasium filled with art, including the amazing Colorbox. This video shows what the MUSEarium looked like with lots of projectors running. I did a little LoopyCam, gave a talk, and met a lot of interesting people. I took the Space Palette to the Independent Marketplace in Sand City (near Monterey), and set it up in the Kids Corner. 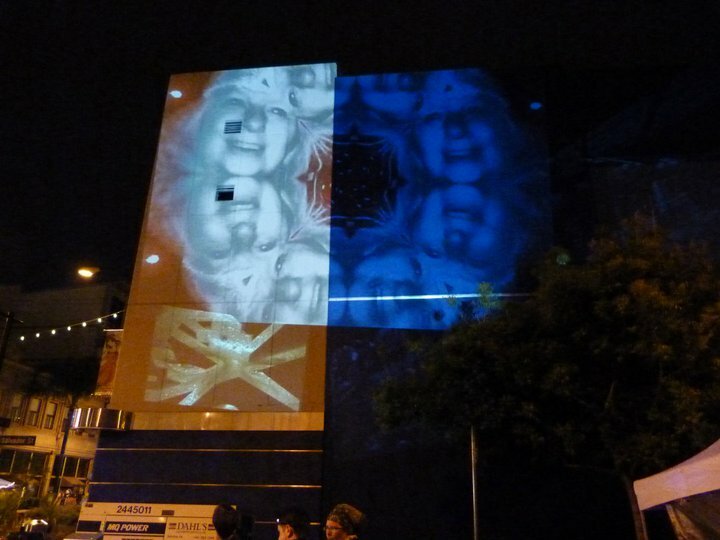 I also took it to the Great Wall of Oakland, where it was projected on a 10-story-high building. I gave a talk about the Space Palette to the San Francisco Electronic Music Meetup, which they captured and edited to produce this excellent video. I took the Space Palette to the NightLife event at the California Academy of Sciences, where it was well-placed and enjoyed in an acoustically-isolated room, right in front of a huge wall-sized aquarium. 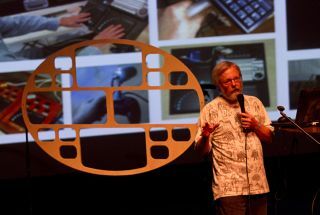 I also gave a talk at a Media Mixr event, where Toshi Hoo took this fabulous image. The large set of slides I skimmed through cover virtually my entire artistic life so far. 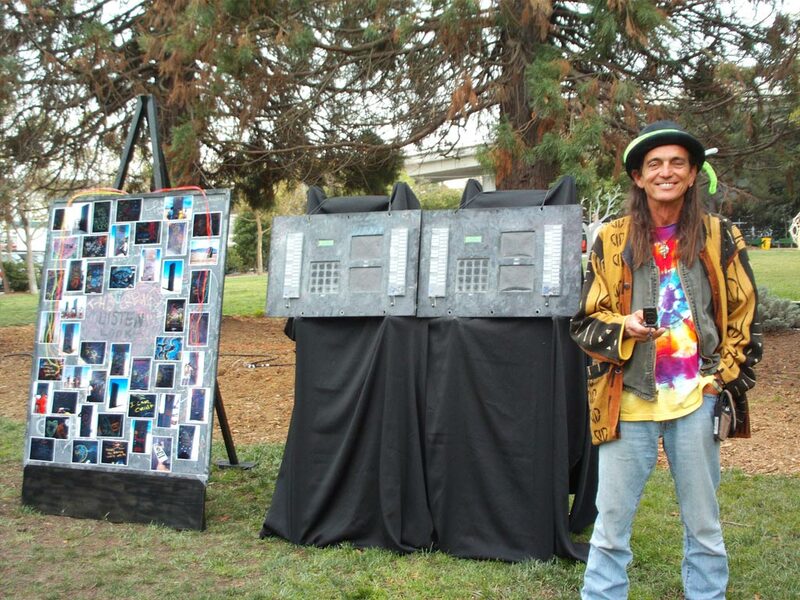 I took the Space Palette to all three Bay Area decompression events - Santa Cruz, San Francisco, and the South Bay (Soulfire). Soulfire was special - the Palette was installed in a large yurt for 2 days and nights. This meant that it was acoustically isolated, and could work even during the day. With chairs and space for an an audience, it saw a lot of use from a lot of very good players, many of whom did not previously consider themselves musicians. I am now routinely fooled - someone who appears to be a good musician (by the way they play the Palette) will turn out to never have played an instrument before. I participated in the Decibel Festival in Seattle, giving a talk about the Space Palette and joining a panel session on new musical instruments (with Roger Linn, Moldover, and Randy Jones). I also showed the Palette at Jigsaw Renaissance, a hacker space in Seattle. I performed interactive video projections for Claudine Naganuma's piece Freedom House. 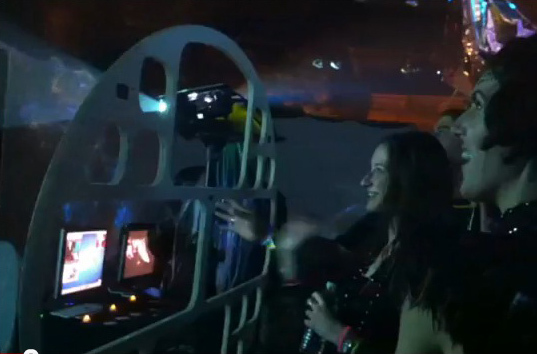 I used a variation of LoopyCam, consisting of a handheld security camera and a Korg Nanokontrol2, to control video effects in realtime as I pointed the camera at the dancers. 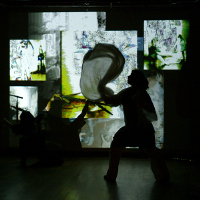 The resulting visuals were projected by three projectors onto silk screens suspended above the sides of the performance space, with the audience surrounding it. Here's a review of the show. Another year, another Burning Man - my 11th in a row. For the first time, I camped in a large theme camp - Illumination Village - making it possible to install the Space Palette right on the Esplanade. It was running from 9pm to 5am almost every night, got a lot of traffic, and was enjoyed immensely. I was delighted to be able to reuse most of Monolith 2.0 (my 2009 installation) to make a wood projector screen that could withstand high winds without any guy wires. I also had LoopyCam running on the back side of the projector screen. I built protective boxes (with fans and filters) for the 2 projectors and 2 laptops. Dinko helped with building the screen, Alyssa helped with lighting and installation, and Claudine tirelessly helped with lighting, installation, and teardown. Last year I brought the Space Palette to the Venice Art Crawl, and they liked it enough to invite me back, so I took the 2012 version of the Palette down to Venice Beach again. Because they were concerned about the volume, I brought a few headphones and a headphone amp. With headphones, people were able to immerse themselves in the experience much more completely - it made a big difference. I brought the Space Palette to Cognitive Awakening as part of the LoveTech Digital Jam Dome. We had a very nice spot on the main/only path between the stages, so lots of people got to enjoy it. The dome ran all three nights till sunrise. Another year, another SubZERO in San Jose. Space Palette was set up on First Street with two projectors - one of them was used to project the visuals on the side of a three-story building. I took Space Palette to Foo Camp, and had a good time interacting with all sorts of interesting people (example: a vegetarian hippie chick with a race car). I went to Symbiosis 2012 and got lots of exercise carrying 50-pound batteries so the Space Palette could be powered without a noisy generator. A 60-lumen LED projector is surprisingly bright, especially when there are no other lights around. This video has some good clips showing people's reactions. I brought the Space Palette to the Illumination Village fundraiser at the Box Shop, using two projectors to display the graphics on a tall wall. I taught a workshop in circuit-bending at the TechShop in San Jose. I've developed a package making it possible to write FreeFrame 1.5 (OpenGL-based) plugins entirely in Python. Contact me if you're interested in the source code for it. I spent a week at an instrument-building workshop at STEIM in Amsterdam, and did a performance there. I've updated the Space Palette page with a gallery and better-organized information. I participated in both weekends of the GLOW Festival in Santa Cruz. The first weekend I had the Space Palette in the atrium of the Museum of Art & History, and the second weekend I used LoopyCam on the street outside. I brought the Space Palette to a member event at the Tech Museum in San Jose. I also showed it in the lobby of the TechShop in San Jose, during First Friday. Several performances on the Space Palette - I gave a "house concert" in our home, and I participated in the Guthman Musical Instrument Competition at George Tech in Atlanta Georgia. I gave my first actual performance using the Space Palette at Turquoise Yantra Grotto in SF. I brought the new oval Space Palette to the Sea of Dreams, a large New Years Eve event. It was doing only graphics, since it was too loud to hear anything. The graphics were newly rewritten in C/C++, running as a FreeFrame plugin inside Resolume. I gave a talk about the Space Palette at Dorkbot SF. Here's the slides, here's some pictures, and here's some video (though the audio is fairly distorted). I gave a talk about the UI aspects of the Space Palette. Here are the slides. I performed with the Space Palette at the Y2K+1 LoopFest in Santa Cruz. Here's a video showing my entire 30-minute timeslot - first there are a few minutes of intro/explanation, then 15 minutes or so of a musical performance, and finally some informal but interesting discussion with audience members. The audience was almost entirely composed of musicians - i.e. other people performing at the 3-day LoopFest. I really enjoyed seeing their instant understanding of what the Palette was doing, and discussing their questions and suggestions. This is by far the best video explaining and showcasing the Space Palette, to date. It's only the second time I've attempted a public performance with the Palette. Unlike the previous performance at the Controller Battle (which was more of a demo/teaser), I think this performance qualifies as something reasonably musical. The explanation at the beginning and the discussions at the end are quite informative and cover a lot of ground. Big thanks to the folks at http://sequencer.de for recording this. With help from Dinko and Claudine, I took the Space Palette to Decompression in San Francisco. Here's some video clips of it. For First Friday in San Jose, I set up the Space Palette in the parking lot next to the Art Glass Center on Market Street. Both sides of the parking lot had nice blank walls, so I projected onto both of them. I drove to Venice (California) to participate in the Venice Art Crawl. I set up the Space Palette at the 811 Art Crawl location, run by Dogtown Artists United. There were lots of artsy people there, and the Space Palette was well-enjoyed. I participated at the SF MusicTech Summit in a panel on DIY instruments. I set up the Space Palette in the main gathering room for people to play with. This was my 10th year in a row at Burning Man, but the first time applying as a theme camp - Multi Multi Touch Touch Camp. 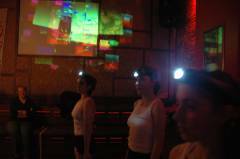 We hosted the Space Palette installation, which people loved - check out the video clips. I gave a presentation at the Art Institute in Sunnyvale as part of their new 2nd Fridays at AI performance series. I covered my artistic work over the last decade or so; here are the slides I used. I added procedural graphic output to the Space Palette, using Processing, and showed it at the Nexus fundraiser. I participated in a panel discussion on a Santa Cruz Community TV show hosted by Denise Gallant: "In the Loop - Art & Technology". The show focused on Burning Man art with four artists, including me. I participated in the West Coast Championship Controller Battle, using Space Palette with a few enhancements - lighted finger gloves, and a swinging tennis ball. Here's a practice session for the performance, and a couple of clips from the battle. The tennis ball was a big hit. 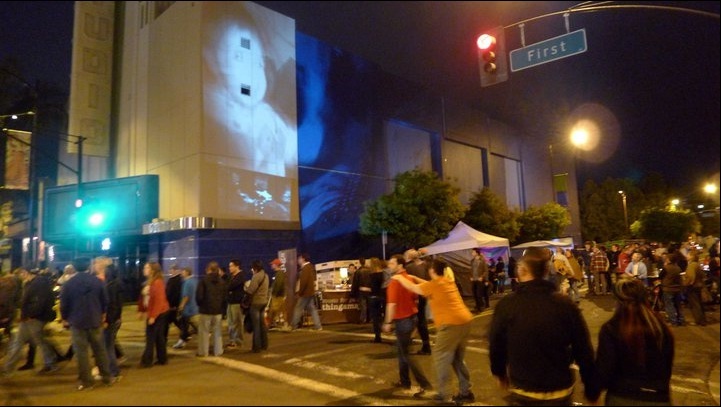 I had a good night at SubZERO in San Jose, installing Space Palette for people to play with as well as projecting LoopyCam on the side of a building. I had a fantastic time at Lightning in a Bottle. Space Palette was set up in the LoveTech dome, and was mobbed almost constantly. Comments heard repeatedly: "I'd love to have this in my living room!" and "We're a band!" 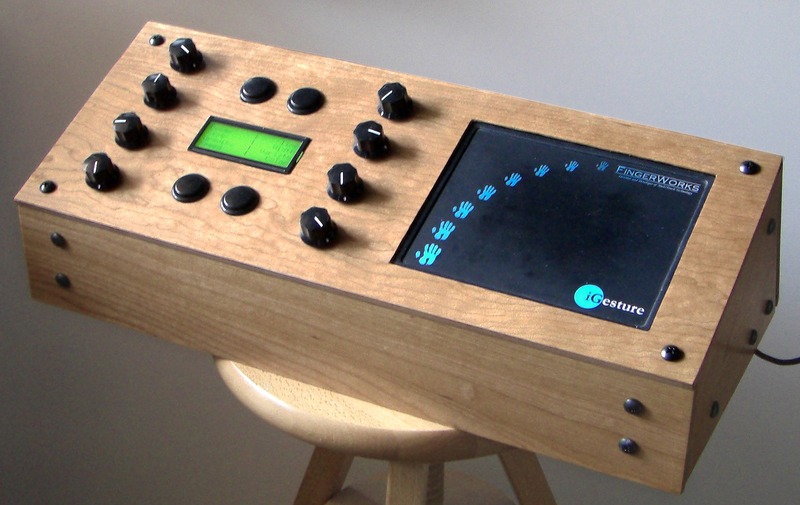 The latest version of my Kinect-based musical instrument is much larger, and is now called "Space Palette". Here's a video showing it in operation. 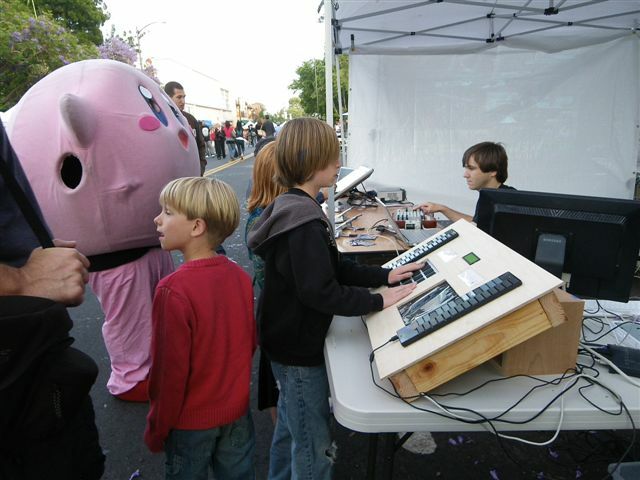 I participated in the Stanford DIY Musical Instrument Tailgate Party by bringing my MultiMultiTouchTouch controller. It was a great way to discover exactly how much shade I need in order for the Kinect to work outdoors. Answer: a lot. I gave a talk at the Kinect Meetup on the first version of my Kinect-based musical instrument. Here are the slides. After seeing Mark Mosher perform, I invited him over to my house to demo the first version of my MultiMultiTouchTouch controller, and ended up giving an interview and demo for the 'Modulate This' blog. Along with many other LoveTech artists, I participated in the Sea of Dreams - a huge New Year's Eve party in San Francisco. 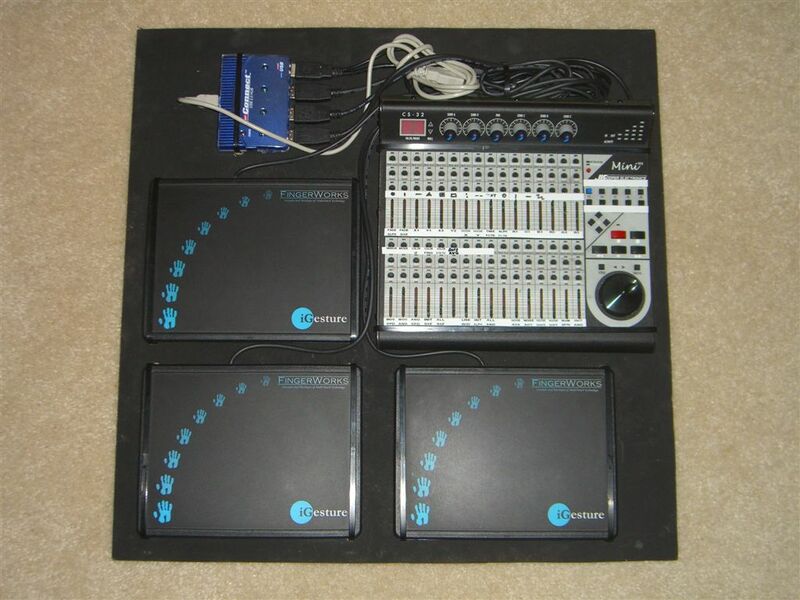 I created an auxiliary control panel (pictured) that made it possible for other people to control LoopyCam effects. The panel also turned out to be very convenient for me, particularly when the camera was mounted on a tripod rather than being handheld. With thousands of people in wild attire and dancing continuously, the environment was a perfect one for LoopyCam. 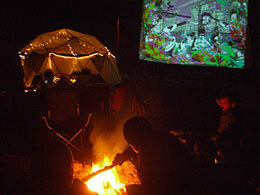 At Prairie Willow House (another name for our home), we hosted a screening of the Punto y Raya Festival Best of 2009. These wonderfully creative abstract visual music animations from around the world are more than a little inspiring. I performed LoopyCam visuals with a number of artists at the Y2KX 10th Anniversary International Looping Festival in Santa Cruz. David Tristram joined me, using ElectroSlate. Here are a couple of YouTube videos from the better sets. I participated with members of SHARE San Jose in the AbsoluteZERO street fair that was part of the 01SJ Biennial in San Jose. These are some video samples of the evening. I went to Burning Man for the ninth year in a row, again camping with my friends Claudine and Dinko. LoopyCart was successfully used for several nights. I developed a new version of LoopyCam, making the hardware controller more flexible and the software more portable. 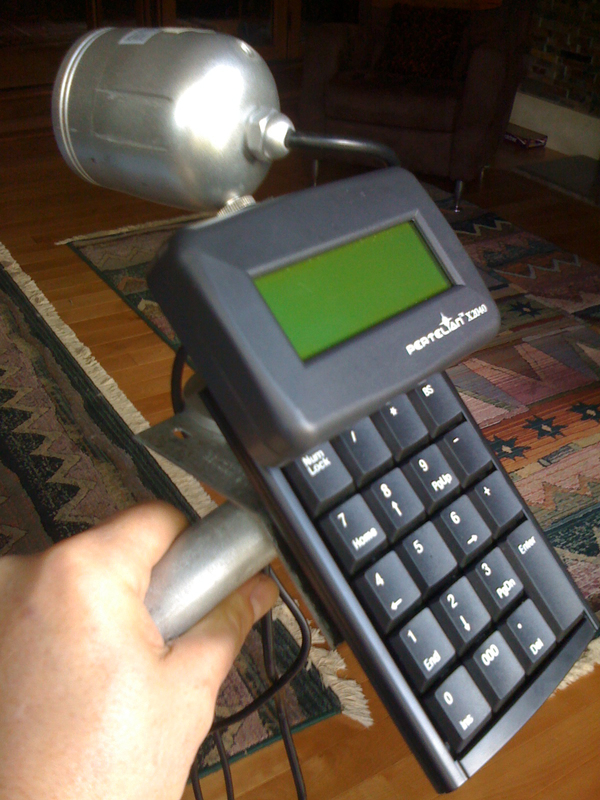 The controller now includes an LCD display and keypad. To use the new LoopyCam at Burning Man, I built LoopyCart - a mobile projector and screen on a trailer. 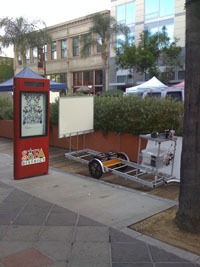 Its first appearance was on First Street in San Jose, at the August "First Friday" event. The Looping Lounge at Anno Domini was part of the SubZERO 2010 festival in San Jose. Some excellent musicians performed, and I had a great time using LoopyCam. The images were also visible on the street, projected on the large screen above Anno Domini's door. I got a number of good recordings, shown here. 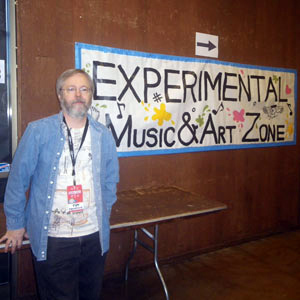 I organized the "Experimental Music and Art Zone" at Maker Faire 2010, with exhibits from several dozen Makers, and a stage used for a dozen performances and demos. I brought the Monolith 2.0 controllers - you can see a couple of ladies playing with them in the picture here. I also brought LoopyCam, and used it to enhance a number of the performances. I spent several days at Yuri's Night 2010 with the LoveTech group, bringing the Monolith 2.0 controllers and LoopyCam for people to play with, and doing visuals with Moldover. April, 2010 I gave a presentation to Guillermo Gallindo's class at the California College of the Arts, talking about my music, software, performances, and installations. I provided LoopyCam visuals to back up Rick Walker and Mike Crane at the Luggage Store Gallery, as part of the Outsound Presents series. Here's a YouTube video of the performance. March, 2010 I played music with some members of SHARE San Jose at a press event for the ZER01 organization, held inside the still-under-construction new terminal at the San Jose Airport. 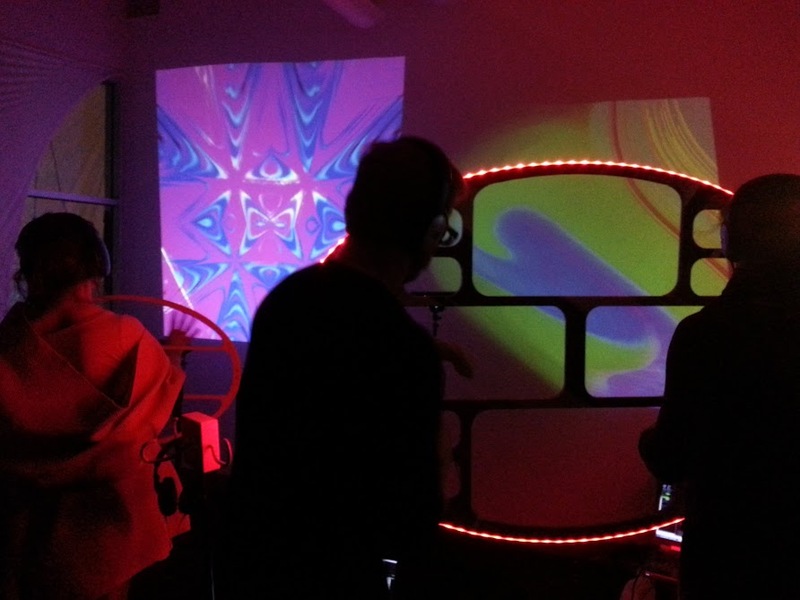 I collaborated and performed with Michael Broxton at LoveTech SF. I used NthControl (my experimental Python-based controller using the Mimo USB-connected touchscreen) to control the musical parameters of an 8-channel MIDI looper. I played everything into the looper in realtime with a MIDI keyboard, using Spectrasonics Omnisphere for the sounds. The notes were also sent via OSC to a second laptop to trigger Python-generated graphics (derived from my previous Python visual music efforts) and further processed in amazing ways inside Michael Broxton's Phosphoressence software, controlled in realtime by Michael using two joysticks. To the right is a picture of our two rigs and a YouTube video of the performance. January, 2010 I gave a talk covering my music, software, performances, and installations at Expression College for Digital Arts. It took over 2 hours to cover it all - here are the slides I prepared. January, 2010 I gave a talk for the PyGameSF group, showing my recent experiments and evolving touchscreen interface, written in Python for use in controlling the parameters of a musical/visual performance. December, 2009 I took the Monolith 2.0 controllers to LoveTech and set them up in the interactive art area for people to play with. October, 2009 I gave a talk about Monolith 2.0 at LoveTech's "LearnTech" event. Here are the slides I used. I took the Monolith 2.0 controllers to Decompression. The smiling guy in this picture is Dinko, my friend who helped construct the Monolith. I used LoopyCam in a performance of Gino Robair's "I, Norton" opera, at the San Francisco Electronic Music Festival. It was probably the best performance I've done so far with LoopyCam - I felt really in tune what what was happening. Here's a YouTube video of the entire performance. 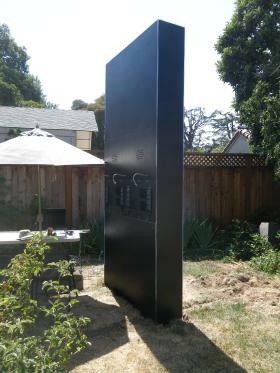 My installation for Burning Man 2009 - Monolith 2.0 - was successfully deployed. Dinko Matkovic, Claudine Naganuma, and Leah Chubb helped to install it on Saturday and Sunday before the event opened. It was up and running on Sunday night, and worked well all week, day and night. Here's the description and pictures. Check out the youtube video to see it being used. SHARE San Jose participated in Starry Night at Villa Montalvo. With invaluable help from Dinko Matkovic on the physical aspects, Monolith 2.0 was finished in time to have a party at our house before dismantling it for its journey to the playa. I used LoopyCam in a performance at the Zeum in San Francisco. SHARE San Jose participated in the SubZero street fair in San Jose. Here's pictures. 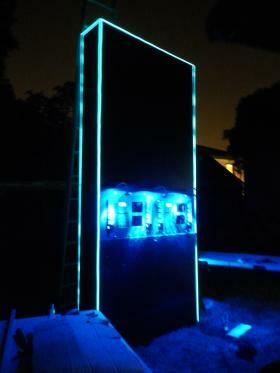 I'm busy working on an installation for Burning Man 2009 - an 11-foot high monolith with interactive music controls in the side. Most of the work is going into the physical aspects - designing a steel base that can support it in high winds without any guy wires. 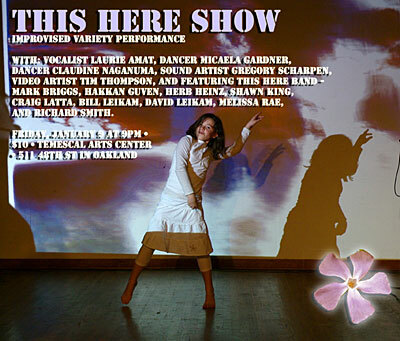 I did video work with LoopyCam in the This Here show at Temescal Arts Center in Oakland. I performed with LoopyCam at the LoveTech SF party. Another great jam with SHARE San Jose at Villa Montalvo. This video shows what was happening. 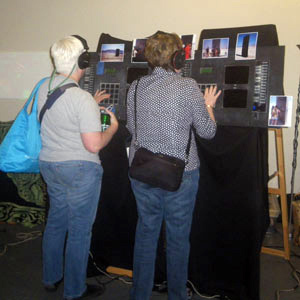 I did more video work with LoopyCam in the This Here show at Temescal Arts Center in Oakland. 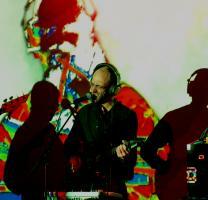 At this month's SHARE San Jose jam, we experimented with transmitting live visuals done in Sacramento by Scott Davey. They were sent with ichat, projected, and then post-processed to produce a second projection. It worked very well - both sides of the connection could see and hear what was going on. There was a lot of other homebrew software and hardware in use that night as well - check out the video. I did a solo performance of visual music at the Luggage Store Gallery in San Francisco as part of the Music by the Eyeful series. I combined my latest two systems, taking the graphical output of Galaxy (a keyboard-driven version of Finger Painting with Planets) and providing it as the video input to LoopyCam. Two projectors showed the output of both systems simultaneously, side-by-side. Everything was driven from my playing on a MIDI keyboard. The performance was recorded - here's the youtube video. I used a much-enhanced version of my LoopyCam system to perform with Herb Heinz's new improvisational group thishere. Here are a couple of pictures showing what it looked like. Note that the loops no longer are restricted to being shown in 4 quadrants. This version had up to 8 loops, and they could move around while looping. I did some more work on my LoopyCam system and created an installation for the front window of the ATA Theater/Gallery on Valencia Street in San Francisco. For the entire month of December, a camera in the window was pointed out at the sidewalk, and video loops were continuously captured, processed, and displayed on a monitor. People could also control the installation with their iphone or other wireless browser. Here's a newspaper article about it. For an "opening night performance", Mira Cook (a friend and dancer) helped to provide the motion and images captured in the video loops - here are clips from that performance. I performed at the New Nothing Theater, doing music and visual simultaneously with new custom software. Everything was done by playing on a normal MIDI keyboard - the notes I played were looped, and triggered the visuals. Here are two videos from that performance. I did a video installation/performance as part of Chance Operations, another great show at the Climate Theatre. My piece was called "Captured Accidents", and I used my LoopyCam to capture and randomly process live video loops of the DOUBLE VISION dancers and show visitors. Here's some video clips showing what the projected results looked like. October, 2008 The SHARE San Jose group had a terrific and fun session at Villa Montalvo in Saratoga, with lots of MIDI and OSC networking and experimentation. Here's some pictures and description. I made a long trek up to Redmond, Washinton to participate in the Redmond Digital Arts Festival, showing Finger Painting with Planets. September, 2008 I gave a talk at BayPIGgies, the Bay Area Python Users Group, about the technical details of my Finger Painting with Planets installation. Here are the slides I used. 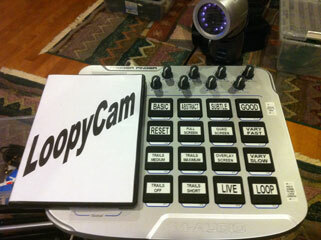 LoopyCam is my latest hardware creation. It's a handheld game controller with a security camera attached, and it lets me interactively record and overlay up to four video loops. I can also insert new recordings in the middle of existing loops. Very portable, very interactive, and lots of fun to play with. The security camera automatically turns on infrared LEDs in low-light situations, so it works great even when there's very little light. 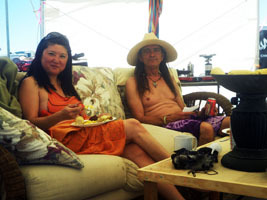 August, 2008 And another year (my seventh) at Burning Man. The playa surface was very hard to bike on, so I wasn't able to get around nearly as much as normal. I performed once at the Entheon camp (doing music and video with my custom controller and a keyboard), and Claudine and I did several nights of realtime video looping at our own camp, for the entertainment of our neighbors and passers-by (who were also included in the looped video). See my burning man page for a few pictures. August, 2008 With members of SHARE San Jose, I set up my Finger Painting with Planets installation and we did an evening of 'space music' at the Starry Night event at Villa Montalvo. I was able to project on the HUGE screen in their outdoor ampitheater, and kids loved playing with the installation as usual. July, 2008 I gave a talk about Finger Painting with Planets at a Bay Area Computer Music Technology group meeting. The slides I presented are here. Along with members of the SHARE San Jose group, I set up a booth with a bunch of interactive music and video toys for the subZERO street fair in downtown San Jose. It was part of the ZeroOne festival. Here's some pictures of our booth at the subZERO fair. Here's some more pictures of SHARE San Jose at subZERO, and a little video. June, 2008 I gave a talk about my Python-based work with VST and Freeframe plugins at a PyGameSF meeting. The slides I presented are here and here. Finger Painting with Planets was shown again (this time as part of the DOUBLE VISION group), in a show at the Climate Theater in San Francisco. 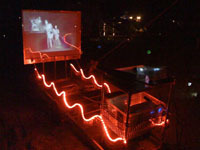 The show was called "Night Lights - an Evening of Luminous Environments," and included several dozen light-oriented installation artists and performers. Here's a video (50mb) showing what members of DOUBLE VISION did at the show. 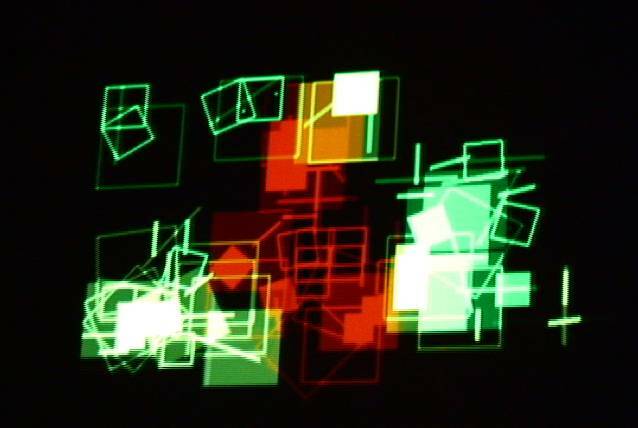 For this show, I simplified the interface of my installation so that it was easier to switch each finger pad from graphics to music, and provided only a single page of parameters. People therefore had an easier time playing with it, with much more consistent results, and I got a lot of compliments about it. To the right is a video showing clips of the installation at the show. 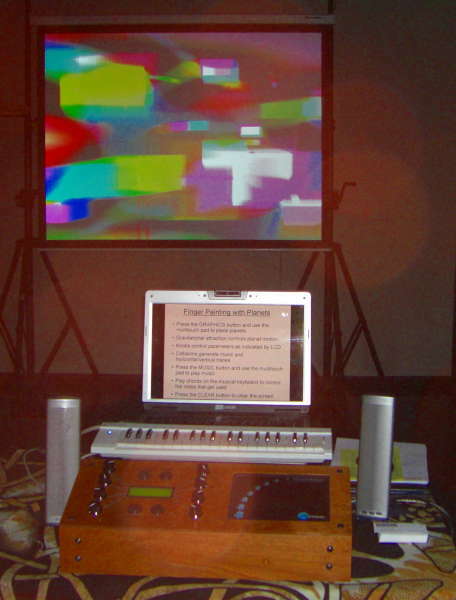 Here's a video I created which shows a compressed version of my performance at Different Skies 2007. 2 hours of interactive video performance compressed down to 2 minutes. See the entry below for October 2007, for details about the Different Skies event. Here's some more information about the installation. 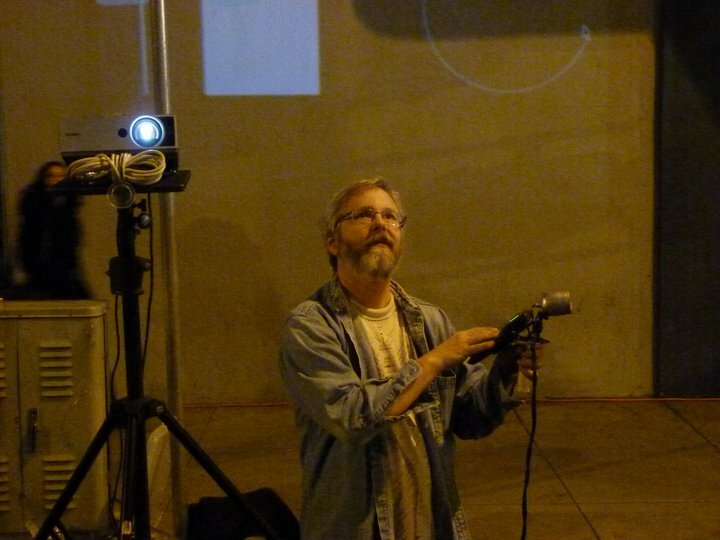 I created an installation for Yuri's Night 2008 at Moffett Field, called Finger Painting with Planets. 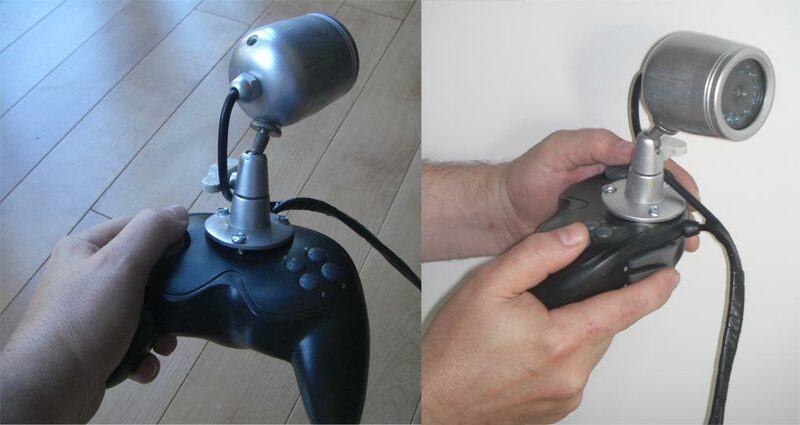 The picture here shows what it looked like, and here's a closeup of the custom controller I built. People used the multitouch pads to place and move planet-like objects whose simulated gravitational attraction created the graphics, which you can see demonstrated in the video to the right. Here's instructions for using it. The software used Salvation as a freeframe host, a freeframe plugin using Python to do the graphics with Cairo libraries, and Chipmunk to help do the physics simulation. The freeframe plugin communicated using OSC to and from KeyKit, which managed all the device interaction and music generation. Music was generated both directly by the pads and as a result of planet collisions. 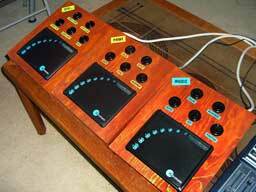 The controllers used a Doepfer USB64 to interface with the knobs and buttons, and a Pertelian LCD display to label the knobs and display their values. I did a gig with Tim Conrardy, doing music and graphics at Works Gallery in San Jose. I used new software that generates graphics using simulated gravitational attraction between objects. The software also did MIDI looping. 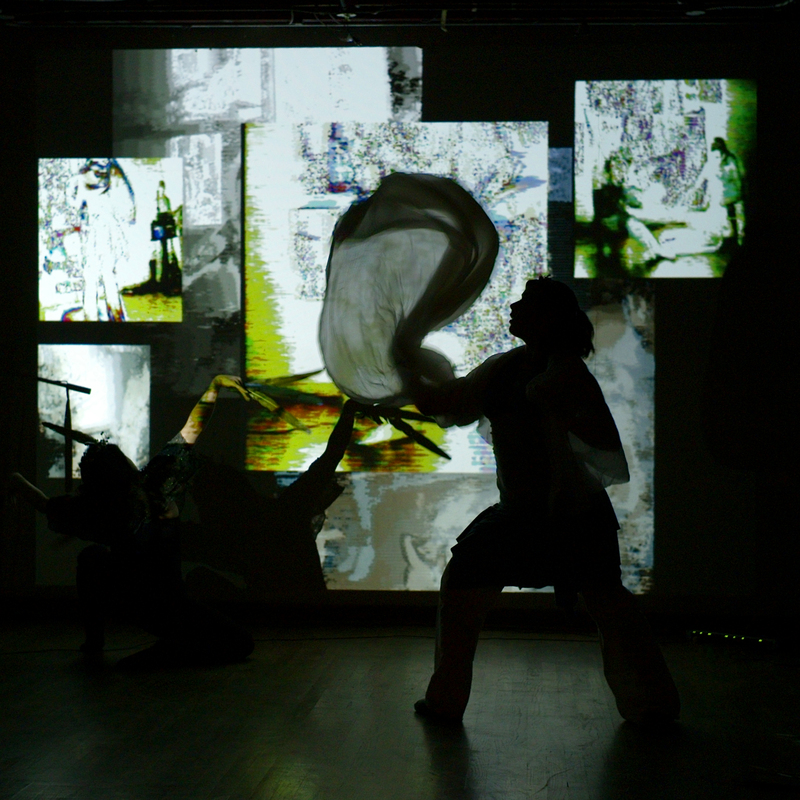 The video here is a collection of snippets from an hour-long live improvised performance. Longer musical selections from the performance can be found here and here. The graphics software is a noteworthy advancement for me - it makes use of Python from within a Freeframe plugin, using Cairo for drawing the graphics, and using Chipmunk for the physics simulation. This means that I'm finally able to combine the two types of graphics that I've been doing separately for the last few years (geometric, and video/bitmap processing) in a single programming environment on a single machine. A bunch of videos I've done with dud are now posted on YouTube, under the username dudland. Check them out. To the left is sample showing the kind of graphics I was doing in 2005.
dud performed at 21 Grand in Oakland as part of the Art Murmur. I used some new realtime video-processing software to generate and manipulate video loops of live camera feeds. There were two cameras - one inside capturing the musicians and dancers, and one outside capturing passers-by and (occasionally) dancers. The two camera feeds were processed, looped, and mixed, and projected with 3 projectors on the inside walls of 21 Grand. There was also a projector and screen outside, so passers-by could see what was going on as well as see their own image when the outside camera was mixed in. I participated in Different Skies 2007, a week-long gathering of extraordinary musicians with a mountain of synthesizers and other musical equipment. The week was spent composing music and preparing for a concert on Saturday night. With 20 or so musicians, I was the sole visual performer, using my iGesture pads to draw graphics in realtime to fit the music. The event is held at Arcosanti in the Arizona desert - this was the fifth year of the event. Here's a review of the concert, and here's some blogs and photos of the week. October, 2007 I gave a talk about my work with Python and VST plugins at the first meeting of the Bay Area Computer Music Technology Group. Here are the powerpoint slides I used, and the nosuch.vstutil module for using VST plugins in Python can be downloaded here. Although the Woodstockhausen 2007 event was cancelled due to rain, I performed the piece I had prepared, anyway, at a small gathering. Here's a video of the piece, recorded and prepared by David Tristram. 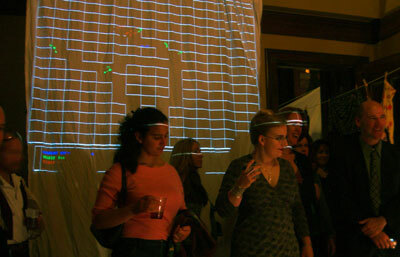 It was called "Finger Fresco 2.0", and both the music and visuals were generated in realtime using the iGesture pads and my custom software. August, 2007 My sixth year at Burning Man. This one was particularly dusty, but entertaining as always. See my burning man page for details, pictures, and videos. 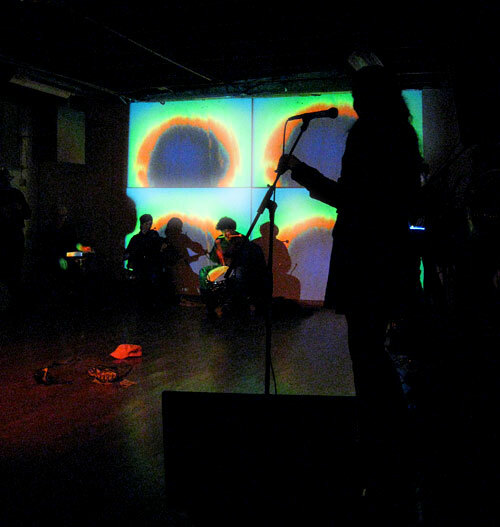 July, 2007 I performed at the Skronkathon event in Oakland, doing a piece I described as "Theme music and title sequence graphics from a 70's TV action series gone horribly wrong". I generated visuals and music simultaneously using the iGesture pads and a keyboard. I went to the Autonomous Mutant Festival with the Double Vision group and had a lot of fun showing Betty Boop cartoons, doing visuals, visiting other camps, and just hanging out. The picture here is of our camp. More pictures here and here. I took Finger Fresco to Electro-Music 2007 in Cheltenham, Pennsylvania. 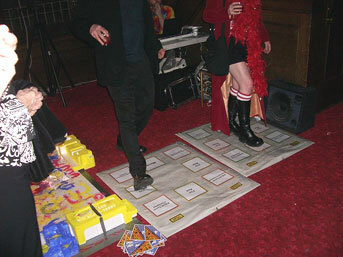 I also did 3 visual performances, in support of Lynn Bechtold, Margaret Noble, and Reverend Mofo. Feedback on my visual work was gratifying - one person called it "amazing visual poetry" and another said it "was like another musical part". This picture shows a bit of the visuals I did for Margaret Noble's set. May, 2007 I did a couple of visual effects (bubbles and other things projected onto a transparent scrim) for Claudine Naganuma's dance performance "Nothing Left to Chance", at SomArts in San Francisco. My latest interactive installation is Finger Fresco, which I set up for people to play with at the fabulous Maker Faire 2007. 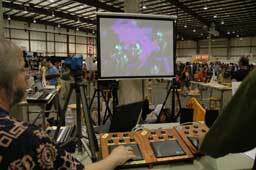 Here's a video showing Finger Fresco in action at Maker Faire. 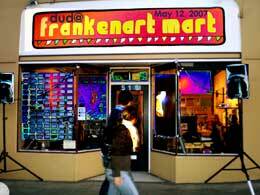 I performed with dud inside the tiny frankenart mart in San Francisco, projecting onto a screen in the storefront window. I performed with dud at the Temescal Arts Center in Oakland. 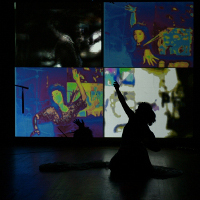 Claudine Naganuma and some of her students danced, and Franz Keller and I did visuals with two projectors. At my retirement party (I've left Network Appliance after 9 years), I was totally surprised and totally honored with a fire-dancing performance by Rebecca and Wolf from Nocturnal Sunshine. Click on the image to download a video of the performance. I participated in an event with the Double Vision group, at the Red Ink Studios in San Francisco. Here Wendy Marinaccio is dancing with my graphics in the background. Here I'm improvising graphics to Luke Dubois' music. 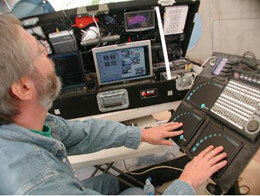 I was using a new custom controller I built with three Fingerworks iGesture pads and a JLCooper CS-32. I participated in a fundraising event for the Double Vision group, at the DragonBar in San Francisco. The picture to the right shows my projected graphics on the wall. For this event, I used a new performance controller I built containing three iGesture Fingerworks pads and a JLCooper CS-32 slider/button box. Here's some pictures and a video (15 seconds into the video you'll see me, the new controller, and then the graphics I'm generating on the wall). October, 2006 I posted some videos showing keykit on youtube. You'll find a tutorial of keykit's GUI from 1994 (actually it was still named keynote back then), and another much more entertaining and geeky demo from 2002. August, 2006 I went to Burning Man again, and performed three times, including once on the Center Camp main stage. Three friends (Herb, Mark, and Claudine) joined me and shared our RV. To the left is the hardhat I decorated to wear at night. Pictures and videos are here. Cathy and I went on a 2-week vacation in China, with our friends Rick and Sue. Here are a LOT of pictures. May, 2006 Yet another show with Double Vision, this time a big 2-day extravaganza called "Evolutionary Patterns & The Lonely Owl (Mutation #2)" at the CELLspace performance space in San Francisco. I created two projector-based installations, each one controlled by a pair of driving controllers. One installation was the "Bouncing off the Walls" one I did at the Spectra Ball, but this time using driving controllers instead of the dance pads - the driving controllers were easier for the audience to figure out. The other installation was a purely-graphic one where people used the driving controllers to "paint" by driving around, firing and bumping into graphical sprites which leave trails as they bounce around. Here's a short video showing a bit of what the installation looked like in action, along with a bit of what else what going on during the show. Here's some larger and more comprehensive video from Friday night, video from Saturday night, and photos showing all the different things that were happening at the show. Another Double Vision group event - this time at the spectacular Spectra Ball in San Francisco. I created an installation using the old familiar dance pads - audience members used them to create a projected maze and fire bouncing balls into the maze. As the balls bounced off the walls of the maze, they would trigger bits of music coming from the corresponding walls of the actual room they were in. The name of the installation was (not surprisingly) "Bouncing Off the Walls". Here's a video of double-vision at spectraball - at 3:00 minutes in there's a segment showing my installation. November, 2005 I performed with the Double Vision intermedia performance group at Mad Horse Loft in Oakland. The event was called "Evolutionary Patterns & the Lonely Owl (Mutation #1)" and combined dancing, painting, music, video, and algorithms in an intense maze of installations that the audience wandered through and interacted with. 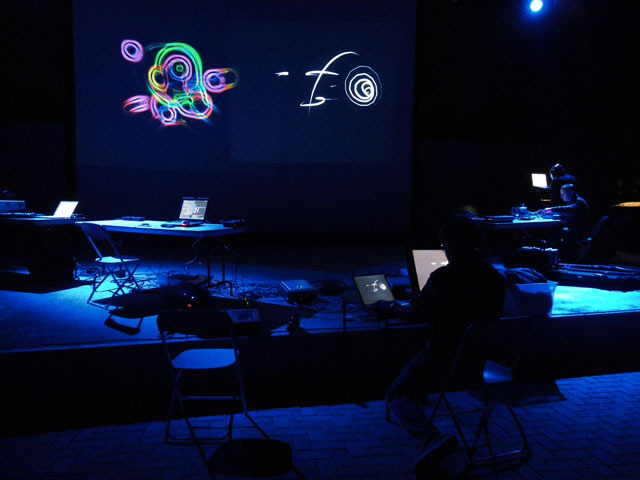 My contribution was an interactive music installation using 2 Fingerworks iGesture pads which controlled a multi-color DNA-inspired "Game of Life" program (written in keykit and python) that generated music and projected graphics onto the walls. Here are some pictures and a video (at 2:00 minutes in there's a segment showing the graphics of my installation). December, 2005 An article about KeyKit, by Dave Phillips, was published in the Linux Journal last March - At the Sounding Edge: Introducing KeyKit. It's a very nice little summary of KeyKit for Linux users. October, 2005 I gave a talk at BayPIGgies, the Bay Area Python Users Group, about my Python-based audio and video projects. Here are the slides I used. 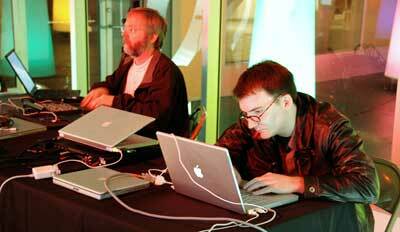 October, 2005 I performed at the Y2K5 International Live Looping Festival with Herb Heinz - we called ourselves hoopla. We used hoops (written in keykit) to do MIDI looping, and used ergo (written in Python) to generate graphics from the MIDI. Here's an MP3 recording of the performance. I talk a bit at the beginning - skip to about 12 minutes in if you want the best music. August, 2005 I went to Burning Man again this year, but I didn't do an art installation. We took our 5th wheel RV, and Steve Klinkner joined us. Pictures and videos are here. July, 2005 I've now started using vvvv and freeframe plugins to integrate and process camera images into my visual improvisations with dud. There are a growing number of video samples of this work at https://www.youtube.com/user/dudland. June, 2005 I went to electro-music 2005, met a lot of interesting people, heard a lot of great music, and gave an hour-long talk on keykit that was well received. Here are the complete slides from the talk. March, 2005 I've started working with Herb Heinz's group dud. I'm writing python-based software to do OpenGL graphics triggered by MIDI data from the drummer. See https://www.youtube.com/user/dudland. I went to Burning Man 2004. My installation this year was called Radio Free Quasar - an antique radio outfitted with a computer generating audio and a laser generating visuals. Check out the description and pictures. December, 2003 I stumbled across a review of my performance at the Works in September. It's at the bottom of this newsletter. December, 2003 nosuch.com no longer lives in a bedroom closet. It now runs on a virtual server maintained by globalservers.com. Bandwidth for downloading mp3s and other things should be greatly improved. October, 2003 Pictures of the lyre appear in some of the many photo albums of burning man and the decompression. E.g. here, here, here, here, here, here, and here. The world tour of the lyre continued on October 12, at the Burning Man Decompression event in San Francisco. 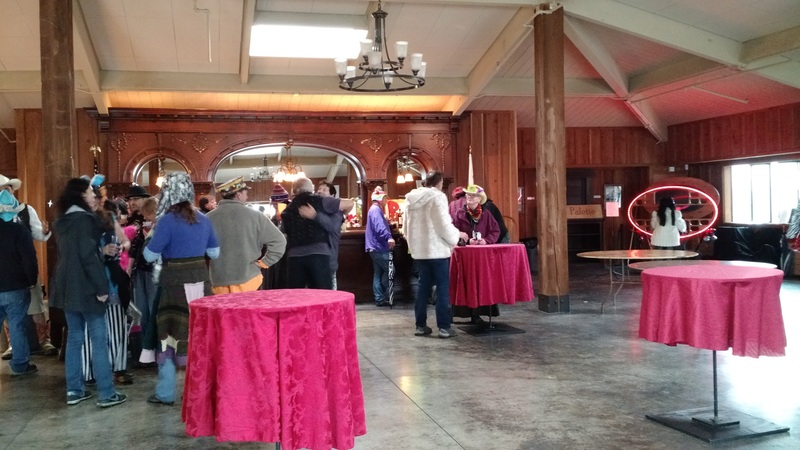 Here's a bunch of pictures of the decompression event. September, 2003 I did a 30-minute performance at the Works gallery in San Jose. I used my usual controllers of late - wireless keyboard hung around my neck while simultaneously dancing on 2 dance pads. This time I used a new set of sounds, and a less-dorky strap to hold the keyboard (if it is at all possible to look less-dorky when you have a qwerty keyboard dangling from your neck). I took my big lyre (see below) to Woodstockhausen 2003. Here's a 40-second video of the lyre in action. The video is 6 megabytes, in mpeg format. The first 20 seconds show the lyre playing pre-recorded music, and the second 20 seconds show people dancing on the pads and generating their own music. See my Woodstockhausen archive for more details on Woodstockhausen 2003 and previous years. August, 2003 I took my big installation (Dancing Under the Stars of Lyra) to Burning Man, and people enjoyed it a lot. Cathy went with me and helped - I couldn't have done it without her. See lots of pictures and a video. I finally gave my talk/demo about KeyKit at the dorkbot-sf meeting. Here are the large number of powerpoint slides I used. The slides contain lots of good info, most of which I flipped through very quickly so I would have time to demonstrate things. Naturally, afterward I remembered all sorts of things I forgot to mention during the talk. It was a packed house. Here are some pictures of the dorkbot event. May, 2003 I've been working for a month or so, so far, on a big installation for this year's Burning Man. See my pictures and description of what I'm building, as I build it. It's called "Dancing under the Stars of Lyra", and you can find it in the directory of Burning Man 2003 Beyond Belief Theme Art. 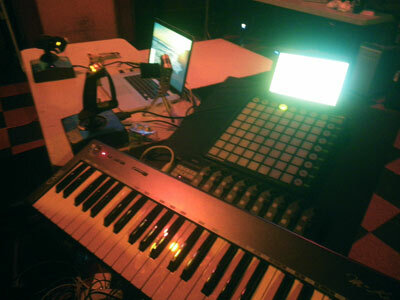 March, 2003 Using a wireless qwerty keyboard and 2 playstation dance pads, I performed a diverse 20-minute set of music at 26Mix in San Francisco. Here's audio of the performance. March, 2003 I did several pieces as part of the microsound mailing list's pi project, using the digits of pi to construct music. 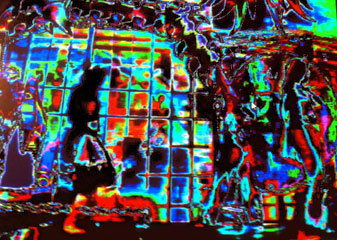 My pieces are Irrational Thoughts (ambient) and Irrational Too (chaotic). February, 2003 I'll soon be giving a talk/demo about KeyKit at the dorkbot-sf meeting, perhaps at the March or April meeting. Here's an outline of what I'll be talking about and showing. August, 2002 I went to Burning Man, and had the time of my life. Here's the diary and pictures of my Burning Man experience. August, 2002 I performed at Woodstockhausen 2002. This time, my piece was "Happy Feet", performed using 4 playstation dance pads. 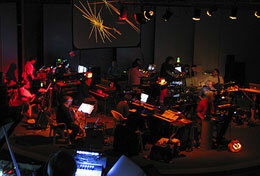 I participated in this year's Woodstockhausen 2001 concert. I wrote a piece called "Oops, I made a typo()", a real-time improvisation that I performed by typing on a computer keyboard. Here's a description, pictures, and audio. July, 2001 Cathy and I took a 1-week vacation to Mendocino and Seattle. Here are the pictures. June, 2001 On June 29, I sat alone in my room in San Jose, California, and played a live 15-minute performance at the opening of a new Internet cafe (The Jade Room) in St. Louis, Missouri. KeyKit was used to send the MIDI data in realtime over TCP/IP - from my Win98 PC through my Linux web server to a Win98 PC in St Louis - all three machines were running KeyKit. Here's the MIDI file containing the entire live performance. It's solo piano stuff, a medley of various compositions and improv. Thanks go to Chris Deckard for making it possible. May, 2001 Another (short) composition - DNA #1 - derived from some genetic algorithms I'm playing with. April, 2001 My latest composition - 23 Shots of Expresso - was played at the "Algorithmic Shorts" concert at UC Santa Cruz. March, 2001 Yippee! I've upgraded this server from a 233 Mhz Pentium II to an 800 Mhz Pentium III. Things should be quite a bit snappier. September, 2000 In a rare public performance, I participated in Woodstockhausen 2000 - a "tiny festival of esoteric music". I performed a piece called "21st Century Caffeine-Based Life Form" using the Expresso tool. Lots of fun, and there were tons of talented people making interesting sounds with technology. July, 2000 Fresh Roast is a new Tune Toy. It's a more advanced application of Expresso, with drums and more musical output. March, 2000 As long as I'm dredging up things past and putting them on my web site, I figured I might as well include my original posting of the Stevie vi clone, which has evolved over more than a decade into the popular vim editor. March, 2000 While converting cassettes to MP3's, I decided to also do my Octave++ cassette from 1994, which contains two noteworthy pieces - Renaissance Ninja and Sunrise/Another Day. March, 2000 I dug out the five MMML Tapes that MMML members put together in the late 80's and early 90's, and decided to put them online as MP3 files. March, 2000 Life Forms is a new Tune Toy. It generates music using Conway's game of Life. January, 2000 I reworked my entire web site, giving it a fresh look and more useful front page. Power Flower is my latest composition, from the Rock Garden 1 project. December, 1999 The Rock Garden 1 project produced 7 final 'gems'. Hurray, I now have another composition for my next CD! October, 1999 Rock Garden 1 is a new collaborative project in the Composer's Quarry. The deadline for final compositions is December 1. August, 1999 Expresso is a new Tune Toy. It's pretty wild. July, 1999 Composer's Quarry is a new Tune Toy. June, 1999 I redid the graphics and navigation on my site, so it should be a little easier to get around. May, 1999 Cathy and I took a 3-week vacation driving to Illinois and back, seeing the western half of the country at close range. Here are the pictures. My CD Prototypical, can now be purchased on Amazon.com! My Autograph composition has been included in the OfDreams Theme in Sharly's Desktop Themes (link no longer works). Widespread Optimism is my latest composition, done for round 4 of the Dare To Fail project. Prototypical, my CD, is now available! You can hear audio and MIDI samples, and read descriptions of how the pieces were written. January, 1998 My parents had their 50th wedding anniversary recently, here are some pictures. November, 1997 Leap of Fate is my latest composition, done for round 3 of the Dare To Fail project. October, 1997 Another Tune Toy! GIF Jam lets you take GIF images and produce music from them. I've created the PLUM list - a database of Programming Languages Used for Music. Another Tune Toy! MIDI Mixup lets you combine aspects of three MIDI files to produce another MIDI file. A new Tune Toy! Pieces-O-MIDI lets you grab a MIDI file and tear it to pieces. April, 1997 AutoPilot is a recent composition done for the Dare To Fail 2 project. I've provided a detailed description of my compositional process, with screen dumps.